Top: Sunrise over Lake Michigan, June 8, 2004. This picture was taken in Chicago without a solar filter. The object that does not appear to be a planet is a bird. Photo courtesy of Bill Arnett(www.nineplanets.org). The 2004 transit of Venus is behind us. I wasn't able to see it in person, but I watched it on the web, and I know some SJAA members travelled for it and got some good looks and photos. The best photo I've seen so far of the transit was an exceedingly sharp close-up from the Royal Swedish Academy of Sciences, showing sunlight off the sun's limb refracting through Venus' atmosphere. It was the Astronomy Picture of the Day for June 10. There are lots of other amazing transit images in the photo gallery at spaceweather.com. I haven't heard yet whether any interesting science has come of the transit, but it did get a few of us talking about the "black drop effect". 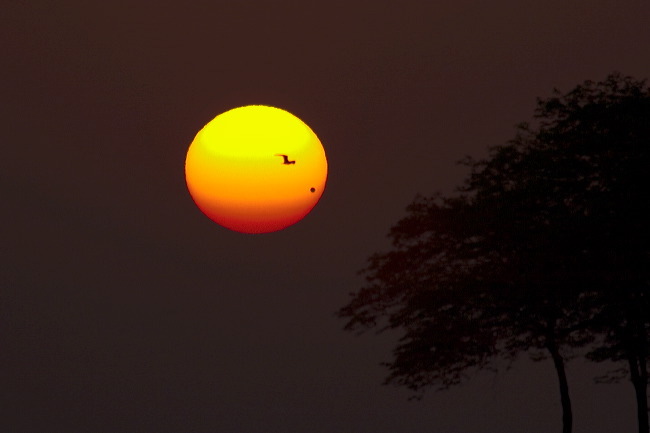 This is the effect seen in Mercury and Venus transits where, near the points of second and third contact when the planet's silhouette is just barely entirely inside the sun's disc, the edge of the silhouette seems to "smear out" and make the planet take on the shape of a water drop, rather than a perfect circle. I'd always thought this was an optical illusion, but quite a few of the images of the Venus transit show the effect, so it's obviously not something the brain is doing. A web search for "black drop effect" revealed that there's lots of disagreement about what actually causes it. I found a few pages stating that it's due to Venus' atmosphere, which sounds plausible until you start wondering how, then, this effect became so well known based on Mercury transits. Hmm! It turns out that you can demonstrate the effect yourself without needing to wait for the next Venus transit (good thing! since that won't be until 2012). Hold your thumb and forefinger nearly touching, at arm's length, against a bright background. An open window works nicely. As you slowly move your fingers together, you'll see a point just before they touch where there seems to be a bit of extra flesh stretching between them. Puzzling, isn't it? If you get more curious, though, you can learn a lot by pointing a digital camera at your fingers while this is happening. For one thing, you'll learn how much chromatic aberration your camera lens has, since this sort of bright/dark boundary shows color fringing more than anything else (just like Jupiter, Mars and the full moon show violet fringing in an achromatic refractor more than other targets do). Zooming in makes the effect even more pronounced; and if you can get your camera to defocus just a little bit, the effect changes a little. Looking at the digital camera images, we convinced ourselves that the reason for the effect is diffraction: light bends around a sharp edge, the same effect the folks in the SJAA telescope building class use when they test a mirror using a Ronchi grating or Foucault tester. I haven't actually been able to show interference bands yet doing this test: perhaps an enterprising reader will try it, using a dark room and a directional light source. It's something to do when you're not looking at planets, anyway. But there are some planets to look at this month as well. Jupiter is still in the sky, low in the west during early evening. It's joined by Mercury during the latter half of the month, showing a slightly gibbous phase now, though in August it will dwindle to a crescent. Venus, having passed across the sun, moves into the morning sky, also showing a crescent. Uranus, in Aquarius, and Neptune, in Capricornus, both transit a bit after midnight and so are available to the late-night observer. Saturn and Mars are too close to the sun to be visible during July. Finally, Pluto, in Ophiuchus, is ideally placed for observing; only a month past opposition, it transits a few hours before midnight, though it never gets very high in the sky, less than 40 degrees.